This is an all-in one plaza for me: coffee-shops, a jazz club, bars, restaurants, an ice cream parlor, a drugstore and a hotel. There is also a playground for children and a tiny bookstore in the center of the plaza which specializes in used books and vintage post cards and pictures of Madrid. What I love about it is that, on one hand, it is your neighborhood plaza. Not just the place to sit for a drink or to have brunch, but also where people take their children after school, or where they walk their dogs while reading the newspaper. And on the other hand, Plaza Santa Bárbara is the starting point of a night out in this part of the city because many cool clubs and restaurants are in this same area. It has it all, daytime activities and nighttime fun. 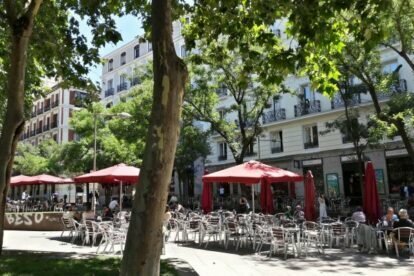 Its location also helps to make it even more charming, because is in walking distance from Gran Vía and very close to Plaza Colón. Also pedestrian street Fuencarral, filled with all kinds of shops, is 10 min away. It would seem busy and noisy at times, but it could also feel quiet and calm at certain hours. It depends on what you want to do, but it is definitely worth a visit.